At General Plastics, you’re not limited to one-size-fits-all standard board stock or foam “buns.” We have the in-house capabilities to fulfill special orders – just ask! Whether that means a custom formulation, providing material in a specific size or shape, pouring in place, or delivering material already machined and bonded for your application, we’re at your service. As your partner, we can satisfy your toughest requirements while reducing your production time, transportation costs and material waste. We often provide custom pours or formulations to satisfy the exacting specifications and quality assurance requirements of our customers in the aerospace, defense and nuclear transportation industries. We’re committed to supporting your ITAR and other critical projects. Special pours to meet your particular formulation needs and dimensions can be delivered within 6-8 weeks. Our normal polyurethane foam bun size is 24” x 48” x 96.” Depending on your formulation and quantity needs, we can pour undersize buns that eliminate waste and shrink your shipping expenses. The larger the quantity, the more cost-efficient a special pour. Tap our chemistry team to assist in matching your specific technical properties. We can also develop special color formulations based on your aesthetic or inventory needs. 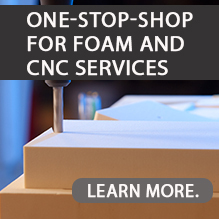 For large tooling and mold projects, we can securely bond foam buns together and CNC- machine them to the dimensions you need – or CNC our foam to your specifications, and then bond it. If we can ship it over the road, we can deliver it ready for your application – even oversized foam pieces or finished large projects. We can pre-score your foam for easier bonding to composite materials such as fiberglass laminating resins. Have our production pros do the sealing and priming before your project leaves our facility. Receive our products at your facility or job site precision-drilled to your drawings or template, ready to use or install. Need a special shape? No problem. Our facility is outfitted with everything from extra-large routers to CNC vertical milling machines, plus a variety of non-CNC cutting equipment to shape your foam. If your supply receiver or container(s) can be transported over the road, we can pour a standard or custom LAST-A-FOAM® formulation directly into it, based on your specs. Why pay for excess material that will go to waste – and the added shipping costs? Our pour-in-place mold services deliver the shapes or dimensions you need. Depending on quantity, they can also put a sizeable dent in your costs.